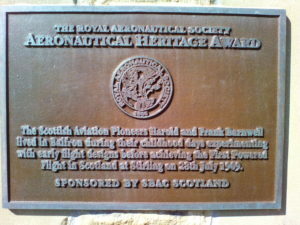 From Balfron were the Barnwell Brothers, Harold and Frank, who began their love affair with gliders and planes in the grounds of Elcho House, Balfron and after a subsequent trip to meet the Wright Brothers in America they returned to Scotland and began building innovative designs in Bridge of Allan. They were the sons of Richard Barwell and Ann Sowter, who were living in Lewisham, Kent at the time of their birth, but moved to Balfron in 1882. Read more in the Balfron Heritage website. In 2013, Taylor Wimpey commissioned Pete Hill, artist blacksmith at P. Johnson & Company to design a memorial to the Barnwell Brothers to be located atop a stone plinth close to the site of the brothers engineering works, the Grampian Motor & Engineering Company at Causewayhead, Stirling. 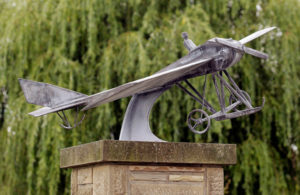 The monoplane, created at Ratho Byres Forge from mild steel, depicts Harold Barnwell in the cockpit on that historic mile long flight in 1911. The galvanized sculpture has been acid etched to give the grey mottled finish & was unveiled at Causewayhead on 27th August 2013.